Care Packages for Soldiers: Boyer Elementary PTO in Prosper, TX Held a Collection Drive for the Troops. 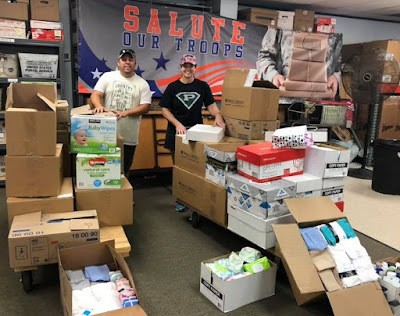 Boyer Elementary PTO in Prosper, TX Held a Collection Drive for the Troops. Thank you Boyer Elementary PTO in Prosper, TX, for organizing a goods drive with your students to collect item for the troops. Each grade was assigned different items to collect. The items they collected were washcloths, socks, foot powder, deodorant, stationary, socks, wipes, etc. The goods will be added to the care packages we'll be mailing in October. Our U.S. Soldiers, Sailors, Airmen, Marines and Guardsmen deployed overseas are going to enjoy getting the boxes filled with the items collected by the students. Items collected by the Boyer Elementary PTO and students in Prosper, TX. Thank you Boyer Elementary for your support.